We’ve all seen ads that make us look twice. Maybe some vibrant visual caught your eye. OR maybe the headline was really provocative. Or maybe the ad was just plain gross — and you were in awe that something that sick got produced for all to see. To wit, Netflix has run a campaign for their new show, Santa Clarita Diet that’s geared to gross one up. Or at least deliver shock value. The ads feature simple white backgrounds, a bit of copy, and…a severed body part. 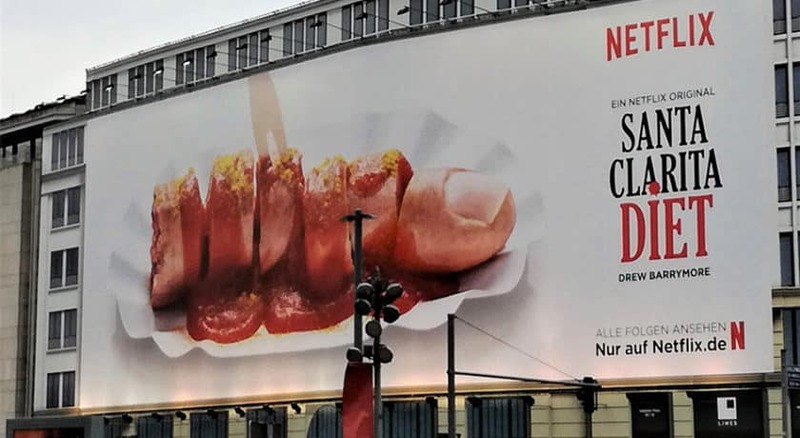 They’re clever, sure, but one in particular is pretty gruesome: a severed finger is laid out like currywurst, sliced up, with all the fixins’. But that alone didn’t spark controversy. Netflix pushed it over the edge with a ‘finger food’ truck. They gave away sliced sausages, in full view of said ad, causing the campaign to come to a fast end after less than 50 sausages were, uh, ‘handed’ out. It begs the question — what is it about a photo of a severed finger that isn’t already too over the top? It takes a sausage-sever to really roil us? Are we desensitized enough that the image isn’t enough to care? The fact that it’s a ‘show’, and, thus, ‘made up’ takes some of the open wound sting out of it perhaps. Or maybe the era of UGC, allowing everyone to post what they want, with no filter, has led us too far down this desensitized path. At least for now, in the experiential realm, on the street, pure ‘gross’ can still be a bit too much to swallow. Oh – sorry.